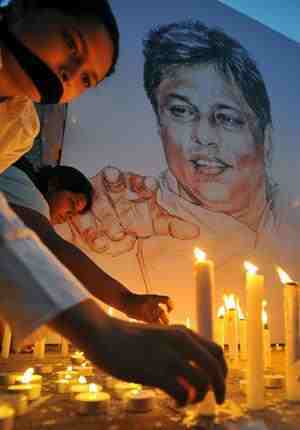 Five years have flashed by since Lasantha was eliminated. Five long years and the Police have failed, nay, they have not been instructed to bring the murderers to court. Lasantha left his imprint indelibly embedded within the print and electronic journalistic history of this country. Those who gave orders to snuff out his probing pen did not envisage that he would continue to have a presence, perhaps larger than life within and outside Sri Lanka. A brilliant and rewarding legal practice lay ahead of Lasantha, but he preferred the thorny path to seek his joy in the practice of Journalism. Many did not agree with his style. Many more loved him and appreciated that he led from the front on their behalf. He was fondly called “The Leader of the Opposition”, a soubriquet which ultimately led those in the corridors of power to prevent him pursuing his vocation. People often ask me what Lasantha’s stand would have been had he lived and was yet the Editor during the last stages of the war. I do not think they intended to be alive at that time and find that question, irrelevant. His family still grieves. His friends, acquaintances and those who read him each Sunday remember him. Miss him. He strode with his head held high. He laid down his head in the same manner. The cowardly act that snuffed out his life could not rob him of that dignity. His memory lives on beyond the grave and will endure way longer than those who undid him. Provided a God exists. More Than 100 UN Soldiers From Sri Lanka Were Deported Under Charges Of Sexual Abuse Of Underage Girls: What About UN Crimes?